Go on about your daily routine, secure in the knowledge that your pets are being properly fed and watered. Sometimes my dog wanders into the kitchen, looks at his food and water dishes for a moment, then walks away again. I can almost see his shoulders slump. And who can blame him? A pile of food and a couple of pints of water that have been sitting there for a few hours. Not inspiring at all. During a busy work week, it can be difficult to make sure your pet is getting the right amount of food and water. Automatic pet feeders and fountains are helping busy pet parents offer fresh, healthy options for our fuzzy buddies. Safety: You want anything your pets use to be non-toxic and shatterproof, obviously. We look for those qualities in anything we carry, so rest assured we have your pet’s health in mind. Some bowls are made from special antibacterial plastic, which can help keep your pets from getting sick. Power: Make sure you know if your automated device will draw power by plugging into a wall outlet, or if it runs on a battery. If it’s a battery, know if it’s rechargeable, and how it gets more juice. Durability: Once your pet knows there’s food inside the magic box, she’ll probably start trying to break in. Make sure your feeder is tough enough to resist insistent paws, claws, and teeth until mealtime. Remote control: Many automatic feeders work on a pre-set timer, but you may want to take direct control of when the door opens. Find out if the feeder uses a free app that will give you that option. Some bowls are not exactly automated, but do use modern technology to provide a better feeding experience. 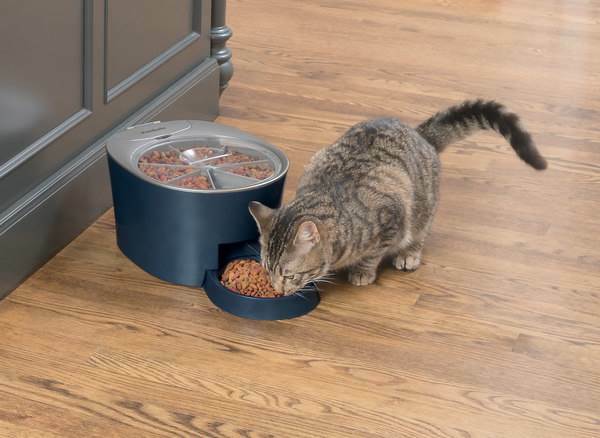 For instance, the PetKit bowl shown below has antibacterial properties, and a scale that weighs out perfect portions of food. Use it with the PetKit app and the PetKit Fit P2 fitness tracker to keep your pet in tip-top shape. 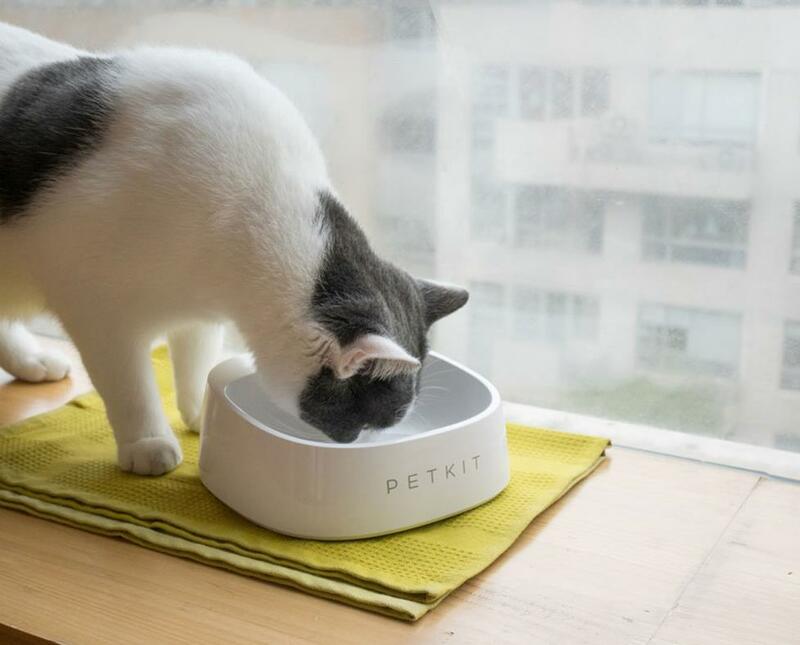 The PetKit Fresh bowl has antibacterial properties that help keep your pet healthy, and a scale so you can measure out precise healthy portions. Innovators are always dreaming up new ways to deliver food to our pets. Here are a few good examples of smart, functional automatic feeder design. The PetSafe Healthy Pet Simply Feed automatic feeder can dispense up to 12 meals per day. With a top-loading feeder like the Simply Feed shown above, you can load dry food into the top of the machine, to be dispensed from the spout throughout the day. This is good for an easygoing pet who just needs a steady supply. The timer on PetSafe's Six Meal Feeder won't let the lids open until a pre-set mealtime. 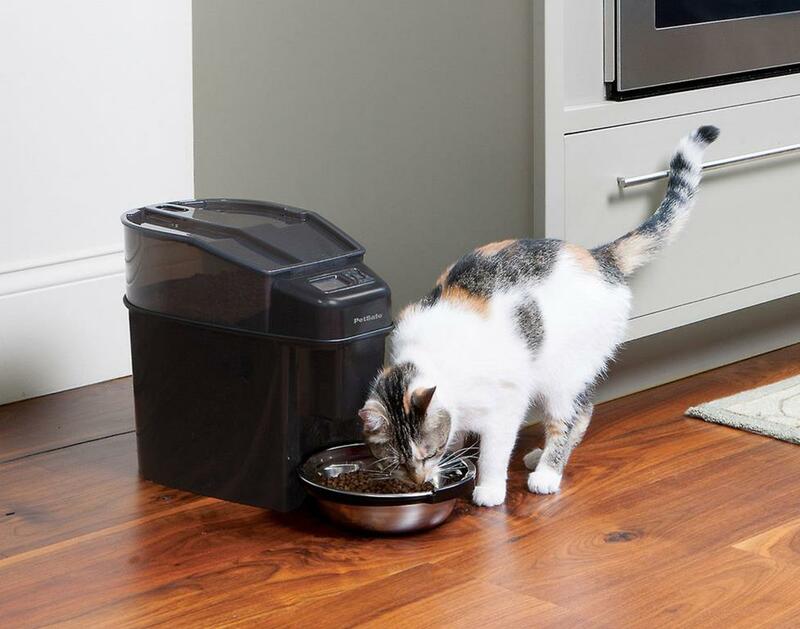 The Six Meal Feeder is a flexible option if you're gone a lot, or if your pet gorges themselves at mealtime. You just fill the trays, close the lid, and then set a timer. Each lid can open at a different time, or even on a different day, depending on your situation. 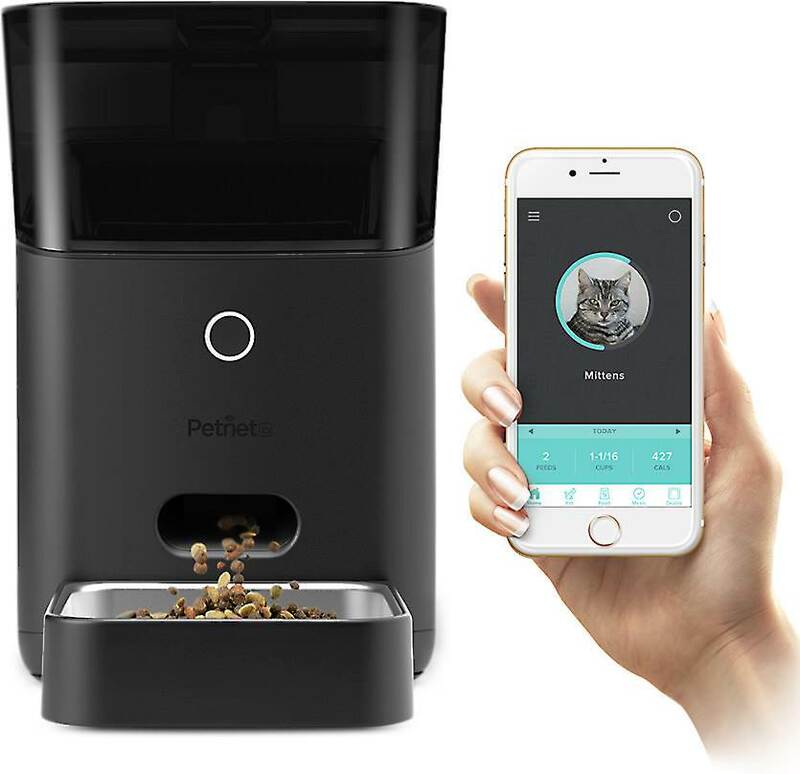 The programmable PetNet SmartFeeder 2.0 works with a smartphone app, so you can remotely control your pet's feeding schedule. 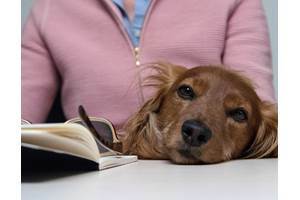 Perhaps your work schedule is unpredictable, and you want to have even more control over your pet's feeding times. A feeder like the PetNet SmartFeeder shown above can give you detailed, app-based remote control. Some feeders, like the SureFeed Microchip Feeder, can be programmed to open only for a specific pet. This is perfect for multi-pet households where one dog or cat needs special food or medication that you don't want the others to have. A stationary bowl is more prone to spills and collecting dirt. My dog also somehow slops food into the water dish, which is pretty gross. An automatic fountain minimizes these problems, and provides a constantly circulating stream of fresh water, which is especially important during hot summer months. Flowing water also entices pets to drink more water throughout the day, which keeps them hydrated and helps prevent urinary tract ailments. These fountains have some special features that make them work better than a simple plastic dish. The PetSafe Drinkwell® Original features a tilted ramp that keeps falling water from splattering. Automatic fountains feature filtration systems that keep debris out of the water your dog or cat is drinking, and eliminates bacteria that can lead to odor or illness. 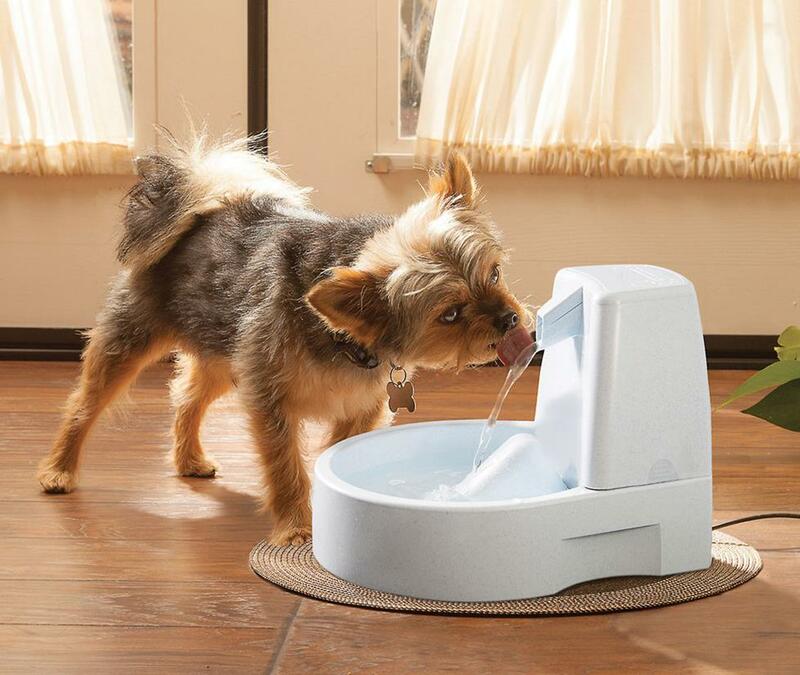 If these utilitarian plastic designs don't really match your decor, consider the PetSafe Drinkwell Ceramic Fountain as a more elegant alternative. You do want to be sure you get a fountain that’s big enough for your dog — you don’t want a Great Dane contorting himself to drink out of a fountain meant for a Chihuahua. Nor the other way around, quite frankly. There are some more or less cosmetic choices to be made. Do you want a fountain that swirls the water around in an arc? One that sends out a gentle stream like a faucet? Maybe a tiered system with levels for dogs of various sizes. You have choices. Talk to your vet to decide an appropriate diet and exercise routine for your pet. Then you can use automatic feeders and fountains alongside a pet fitness tracker to make sure your fuzzy loved one is at the peak of health. Our advisors can help you find the right products to keep your pet healthy, happy, and by your side. Give us a call at 1-888-955-6000.